The accommodation is simple airy and comfortably furnished. Benefitting from beautiful views of Loch Linnhe and the Morven hills. This pleasant cottage is located on a small working farm, but sits in a private and secluded spot just 30 yards from the foreshore. With excellent facilities and rewarding activities nearby such as boat hire, pony trekking, cycling along route 78 and salmon and sea trout fishing can be arranged locally. The area is excellent for hill-walking allowing your adventurous side to escape. This is also a great location to explore the West Coast and it’s abundance of wildlife and spotting the sea-life, including otters and sea eagles. The accommodation offers TWO bedrooms: 1 king-size and 1 twin. Bathroom: with shower over bath. Lounge/diner: TV, DVD and hi-fi. Kitchen: fridge/freezer, auto washing machine, tumble dryer, dishwasher and microwave. 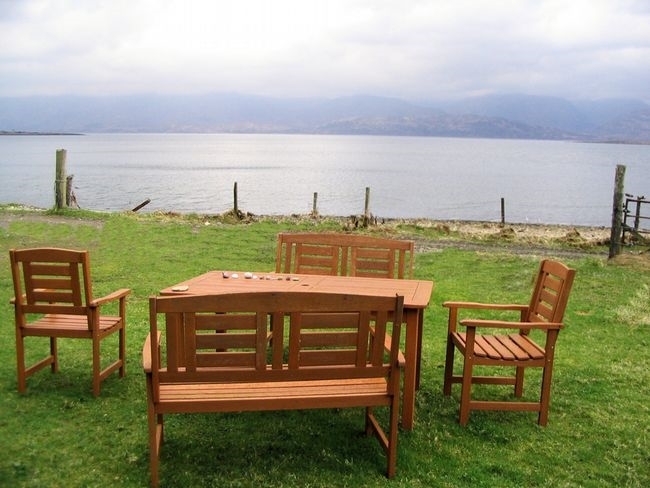 Outside: pleasant garden with furniture provided to relax and enjoy the wonderful view. Amenities: bed linen and towels available for hire by prior arrangement. Electric by meter (Charged at current rate.) Night storage heating and panel heaters. Regret no smoking. 1 well behaved dog welcome. Arrival: 4pm.